Mammoth is the common name for any of the large, extinct elephants comprising the genus Mammuthus, with many species equipped with long, curved tusks, and in northern species, a covering of long hair. As members of Elephantidae (elephant family), they are close relatives of modern elephants and in particular the Asian elephant (Elephas maximus). They lived from the Pliocene epoch, about four million years ago to around 4,500 years ago. The best known of fossil vertebrates is the woolly mammoth, Mammuthus primigenius, which was about the same height and weight as modern Asian elephants. Mammoths have captured the human imagination and added to the wonder of nature, appearing in popular literature, movies, and art. However, they also have provided a valuable food resource to humankind's early ancestors and played a key role in food chains of earlier times. The discovery of fossils of mammoths, and the subsequently growing evidence that mammoths are extinct species, added further evidence to the model of the history of the biosphere as one of evolution from simple systems and species to complex systems and species with a multitude of species passing through a process of origin, growth and expansion, decline, and death (extinction). The idea that species could originate and later reach a state of extinction became a challenge for people whose religious views presumed that a perfect creator God would not create a species then let it become extinct. Elephants are a family (Elephantidae) in the order Proboscidea in the class Mammalia. Elephants are characterized by thick skin, tusks, large pillar-like legs, large flapping ears, and a proboscis, or trunk, that is a fusion of the nose and upper lip. There are only three living species, but many other species are found in the fossil record, having become extinct since the last ice age, which ended about 10,000 years ago. The mammoths are the best known of these. 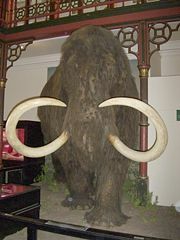 Mammoths comprise the genus Mammuthus. Unlike the generally straight tusks of modern elephants, mammoth tusks typically were curved upward, sometimes strongly curved and spirally twisted, and were long (ANS). Mammoth skulls tended to be domelike and with smaller ears than modern elephants, and their molars were similar to other elephants in being large, complex, specialized structures, with low ridges of dense enamel on the surface (ANS). The Mammuthus genus generally is placed in the same subfamily (Elephantinae) and subtribe (Elephantina), as the modern Asian elephants (genus Elephas), whereas the modern African elephants (genus Loxodon) are placed in the same subfamily but another tribe (Loxodontina). Based on studies of their close relatives, the modern elephant, mammoths probably had a gestation period of 22 months, resulting in a single calf being born. Their social structure was probably the same as that of African and Asian elephants, with females living in herds headed by a matriarch, with bulls living solitary lives or forming loose groups after sexual maturity. The word mammoth comes from the Russian мамонт mamont, probably in turn from the Vogul (Mansi) language. It is a common misconception that mammoths were much larger than modern elephants, an error that has led to "mammoth" being used as an adjective meaning "very big." Certainly, the largest known species, the imperial mammoth of North America, reached great size, being up to at least five meters (16 feet) at the shoulder. This is larger than the largest group of extant elephants, the African elephants, which are up to 3.9 meters (13 feet) tall. In general, larger mammoths would probably normally weigh in the range of six to eight metric tons, but exceptionally large males may have exceeded 12 metric tons, again larger than the African elephants. However, most species of mammoth were only about as large as a modern Asian elephant. For example, woolly mammoths had about the same height (2.8 to 3.4 meters, or nine to 11 feet) and weight (four to six tons) as the Asian elephants (ANS). Woolly mammoth tusks were considerably larger than modern elephants, sometimes being larger than 4.2 meters (13. 5 feet) in length (ANS). A 3.3 meter (11 ft.) long woolly mammoth tusk was discovered north of Lincoln, Illinois in 2005 (IDNR 2006). There also have been fossils of species of dwarf mammoth found on the Californian Channel Islands (Mammuthus exilis) and the Mediterranean island of Sardinia (Mammuthus lamarmorae). Mammuthus exilis was about 1.2 to 1.8 meters (four to six feet) at the shoulder (ANS). There was also a race of dwarf woolly mammoths on Wrangel Island, north of Siberia, within the Arctic Circle. The earliest fossils of mammoths are those found in Africa that trace back about four million years. From three to 3.5 million years ago, mammoths expanded into Europe, with the first non-African species being the southern mammoth (Mammuthus meridionalis), which extended through Eurasia and entered North America in the early Pleistocene. The earliest fossils of woolly mammath are from abut 250,000 years ago, but were transitional forms, with more advanced forms appearing later, and by 100,000 years ago the woolly mammoth was found from the British Islands through Siberia into North America (ANS). The woolly mammoth was the last surviving species of the genus. Most populations of the woolly mammoth in North America and Eurasia died out at the end of the last Ice Age, about 12,000 to 10,000 years ago. A definitive explanation for their mass extinction is yet to be agreed upon. A small population survived on St. Paul Island, Alaska, up until 6000 B.C.E. (Schirber 2004), and the dwarf woolly mammoths of Wrangel Island in the Arctic Circle survived at least until 4,700 years ago (ANS), with some radiocarbon dating evidence placing their extinction only around 2000 B.C.E. (Vartanyan et al. 1995; ANS). About 12,000 years ago, at the end of the Ice Age, warmer, wetter weather was beginning to take hold. Rising sea levels swamped the coastal regions. Forests replaced open woodlands and grasslands across the continent. The Ice Age was ebbing. As their habitats disappeared, so did the bison and the mammoth. Whether the general mammoth population died out for climatic reasons or due to overhunting by humans is controversial. Another theory suggests that mammoths may have fallen victim to an infectious disease. A combination of climate change and hunting by humans is the most likely explanation for their extinction. New data derived from studies done on living elephants (see Levy 2006) suggests that though human hunting may not have been the primary cause for the mammoth's final extinction, human hunting was likely a strong contributing factor. Homo erectus is known to have consumed mammoth meat as early as 1.8 million years ago (Levy 2006, 295). However, the American Institute of Biological Sciences also notes that bones of dead elephants, left on the ground and subsequently trampled by other elephants, tend to bear marks resembling butchery marks, which have previously been misinterpreted as such by archaeologists. The survival of the dwarf mammoths on Russia's Wrangel Island likely was due to the fact that the island was very remote, and uninhabited in the early Holocene period. The actual island was not discovered by modern civilization until the 1820s, by American whalers. A similar dwarfing occurred with the pygmy mammoth on the outer Channel Islands of California, but at an earlier period. Those animals were very likely killed by early Paleo-Native Americans, and habitat loss caused by a rising sea level that split the Santa Rosae into the outer Channel Islands. In May of 2007, the carcass of a six-month-old female mammoth calf was discovered encased in a layer of permafrost near the Yuribei River in Russia where it had been buried for 37,000 years. Alexei Tikhonov, the Russian Academy of Science's Zoological Institute's deputy director has dismissed the prospect of cloning the animal, as the whole cells required for cloning would have burst under the freezing conditions. DNA is expected, however, to be well-preserved enough to be useful for research on mammoth phylogeny and perhaps physiology (Rincon 2007; Solovyov 2007). Thomas Jefferson, well-versed in the natural sciences, suggested to Lewis and Clark that they might find mammoth fossils during their explorations of the American West. 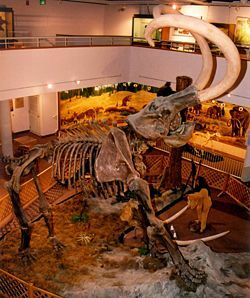 Initially, the finding of fossils of mammoths, as with the fossils of other taxa known no longer to exist on Earth, presented a religious/philosophical problem for those who professed Divine Creation: If God is perfect, and He made a perfect creation, why would He allow any of his created organisms to become extinct? For others, the finding of fossils conflicted with a view of the earth as but thousands of years old. In due course, each of the world religions has made its own adaptation to the substantial evidence that numerous species such as the mammoths have come and gone over great periods of time. ↑ Oxford English Dictionary: Mammoth (2000). ↑ Religious Tolerance. Beliefs of various faith groups about origins.Retrieved August 21, 2008. Academy of Natural Sciences (ANS). n.d. Woolly mammoth (Mammuthus primigenius). Academy of Natural Sciences. Retrieved May 15, 2008. Capelli, C., R.D.E. MacPhee, A.L. Roca, F. Brisighelli, N. Georgiadis, S.J. O'Brien, J. Stephen, and A.D. Greenwood. 2006. A nuclear DNA phylogeny of the woolly mammoth (Mammuthus primigenius) Molecular Phylogenetics and Evolution 40(2): 620–627. Retrieved May 15, 2008. Dmitry, S. 2007. Baby mammoth find promises breakthrough. Reuters July 11, 2007. Retrieved May 15, 2008. Illinois Department of Natural Resources (IDNR). 2006. Recently discovered 11-foot long woolly mammoth tusk on display at the Illinois State Museum. Illinois Department of Natural Resources Press Release, August 14, 2006. Retrieved May 15, 2008. Levy, S. 2006. Clashing with titans BioScience 56(4): 292-298. Retrieved May 15, 2008. Lister, A., and P. Bahn. 1994. Mammoths. London: MacMillan. ISBN 0025729853. Martin, P. S. 2005. Twilight of the Mammoths: Ice Age Extinctions and the Rewilding of America. Berkeley: University of California Press. ISBN 0520231414. Mercer, H.C. 1885. The Lenape Stone or The Indian and the Mammoth. University of Georgia Libraries. Retrieved May 15, 2008. Rincon, P. 2007. Baby mammoth discovery unveiled. BBC. July 10, 2007. Retrieved May 14, 2008. Schirber, M. 2004. Surviving extinction: Where woolly mammoths endured. Live Science. Retrieved May 15, 2008. Stone, R. 2001. Mammoth: The Resurrection of an Ice Age Giant. London: Fourth Estate. ISBN 1841155187. Vartanyan, S.L., Kh.A. Arslanov, T.V. Tertychnaya, and S.B. Chernov. 1995. Radiocarbon dating evidence for mammoths on Wrangel Island, Arctic Ocean, until 2000 B.C.E. Radiocarbon 37(1): 1-6. Retrieved May 15, 2008.